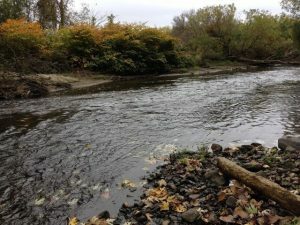 Some environmental groups say they’re frustrated with the lack of progress on talks over the cleanup of the Housatonic River. The key dispute is where to dispose of river sediment containing toxic PCBs. The EPA’s proposed cleanup plan calls for putting the toxic waste in out-of-state facilities approved by the agency. But General Electric, which polluted the river decades ago, wants to build disposal sites near the river. So a mediation was convened. But Tim Gray of the Housatonic River Initiative had harsher words. “It’s been going like a tortoise. You know, I am not supposed to say anything about this,” he told the crowd at the meeting. That’s because mediation participants, like Gray, signed an agreement requiring confidentiality (PDF). The agreement wasn’t signed by all the parties until late last week. “There have really been no meetings that mean anything so far,” Gray said. “I have no hopes for this mediation, and I actually hope that it breaks down,” said Judith Herkimer, from the Connecticut group Housatonic Environmental Action League (HEAL). Herkimer said the groups involved did not have the chance to agree on the choice of mediator — Washington, D.C.-based attorney John Bickerman, who was not at the meeting. Audrey Cole, also part of HEAL, said at the meeting Bickerman spoke negatively about some of the participants in the mediation. “He spoke openly in disparaging terms of people at the table. So I don’t know how any trust can be implemented,” Cole said. Bickerman told NEPR that’s not true. Bickerman said the mediation is making progress, and he’s not troubled by the pace. But at the meeting, Dennis Regan, the Berkshire director of the Housatonic Valley Association, pressed Tagliaferro about the timeline. “How long is this process going to take? Is there a drop-dead date? If it’s not working after four years, are they going to table it?” Regan asked. 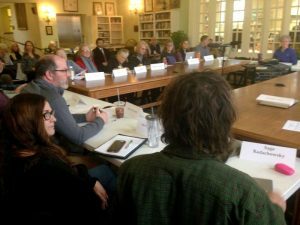 Back in November, Alexandra Dunn, who at the time headed up New England EPA, said it should be apparent within a few months if those taking part in the mediation would find common ground.